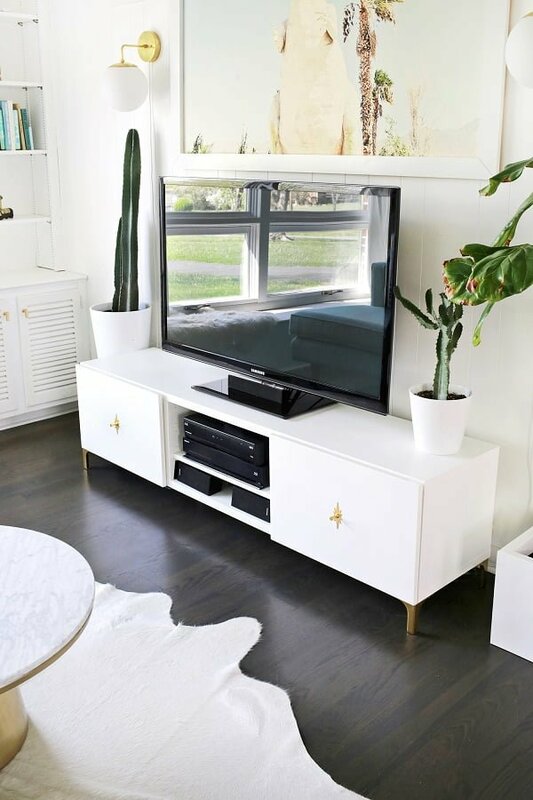 If you have a TV at home (and you probably do) you need a place to keep it and you have to do it in a way that doesn’t mess up your decor. Better yet, an attractive DIY TV stand or media console can spruce up your home decor and it can be a great way to freshen it up quickly. It can provide you with extra storage space and room for display by making the electronics look like part of your home style. 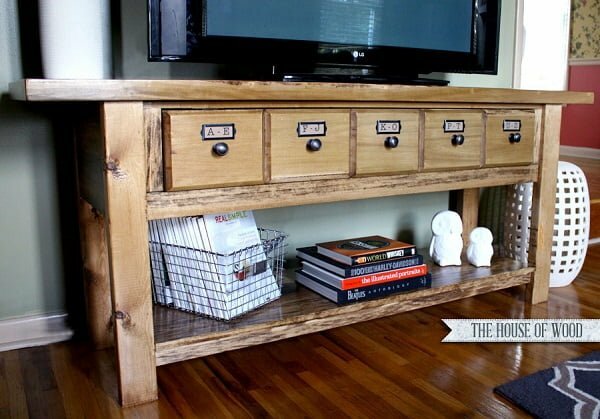 Make this TV console for a rustic farmhouse look. It’s a simple enough project that will cost you under $100. In a nutshell you only need several 2x8s, 2x4s and 2x2s of wood and of course, some paint/stain for the finish. Some power tools are needed to finish this woodworking project but the instructions provided in the tutorial (follow the link) are simple enough to follow. Lovely Anna White has these plans for a sliding door console and it’s a wonderful piece of furniture to build. 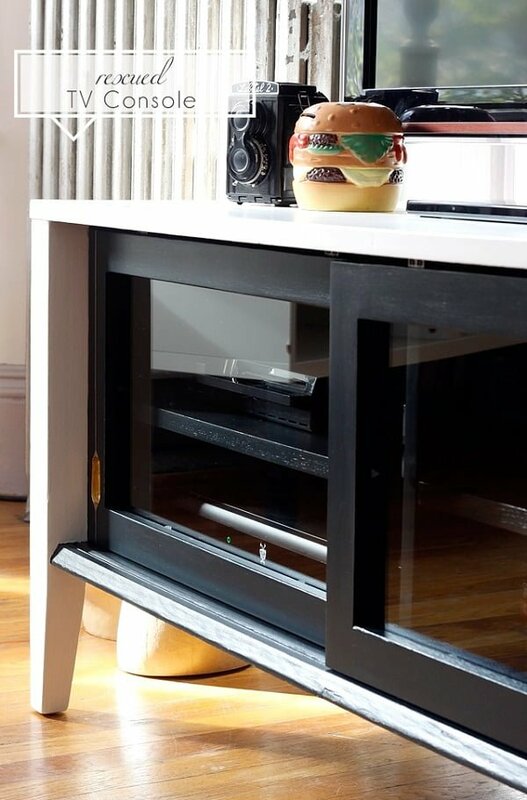 It has tons of space for closed and open storage and makes your TV look good. Compose this exquisite sliding door console with ease and take the time to create a welcoming and inspiring space. Not the most time-consuming project, you will be able to create a fashionable and practical piece. This console uses two opposite-direction sliding doors, thus offering plenty of storage space and more functionality of the space itself. With a medium hardwood countertop, the console table will definitely need wall hangers for stability and support. Made of typical hardwood barn doors, the console uses white wood paint and a simplistic black frame. If you have a more creative gene, the console/buffet can find its place in almost any room of your house. We love simple DIY projects that result in useful items. You can make a lot of things from wood crates and this is one of them. The project is pretty much straightforward. 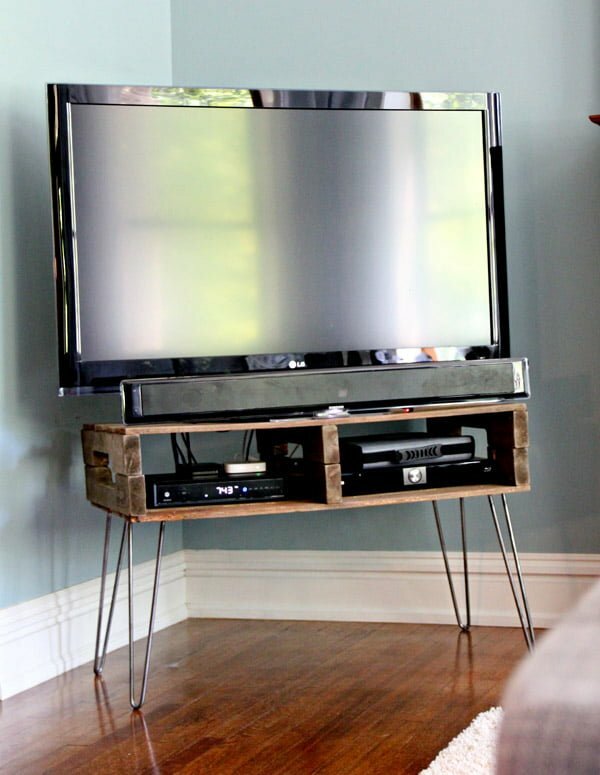 This DIY TV stand has a look of industrial and rustic and it’s a wonderful accent in any home decor. We just love this decor vignette and encourage you to build this piece of furniture yourself. The tutorial explains how to do it well. 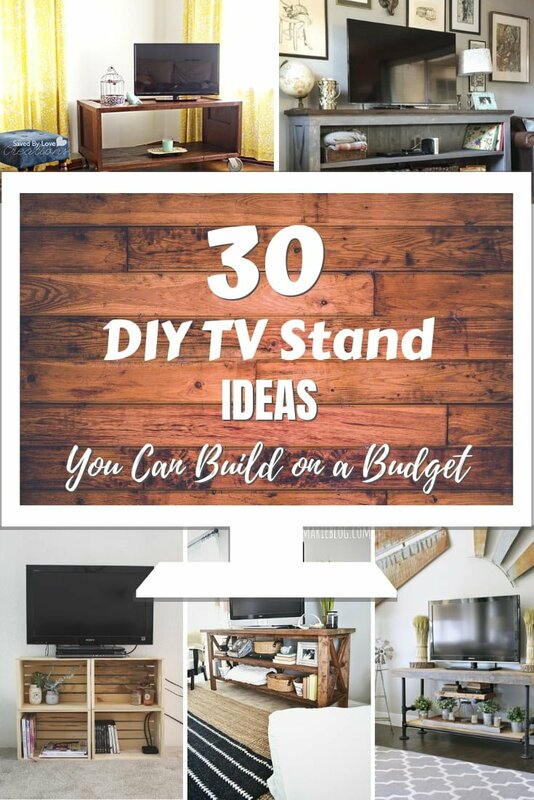 This DIY TV stand will save you both time and energy if you are into quick and affordable projects. Made of thick hardwood planks and pipe-like stands, the table is as easy in concept as it is in execution. 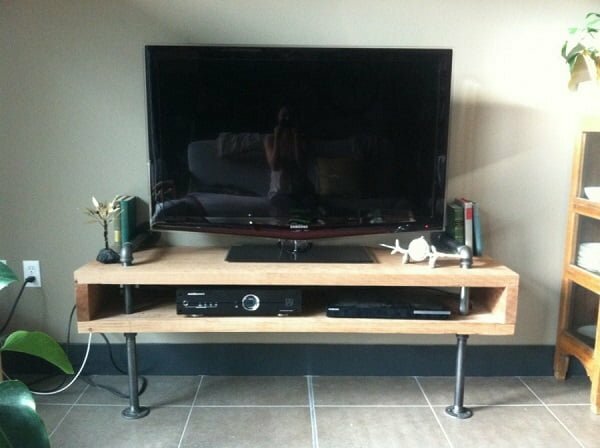 The TV stand is built with a bottom hardwood shelf for storage, and a pull out tray shelf just below the main stand itself, to wrap and hold all cables, thus preventing annoying cable tangling. Having a rolling media console table is not so much about function as it is about style. A touch of industrial style will definitely make your decor more interesting. It’s a breeze to build it by following the tutorial as well. This magnificent rolling console table concept is as practical as it is stylish. Due to its simplistic, yet chic outlook, the rolling console table can be easily done at home. Use medium pieces of lumber, casters, and bolts to attach them properly, as well as various types of screws and flanges to add dynamics to the piece. Finally, add polishing finishing touches by painting or staining the console table to fit your room details magnificently. The console table can find its place anywhere in the house, and thanks to its mobility, all you have to do is move it. Nifty! We see more and more farmhouse style in your pictures on Pinterest and we love this trend. It takes rustic to another level and it’s full of goodness. 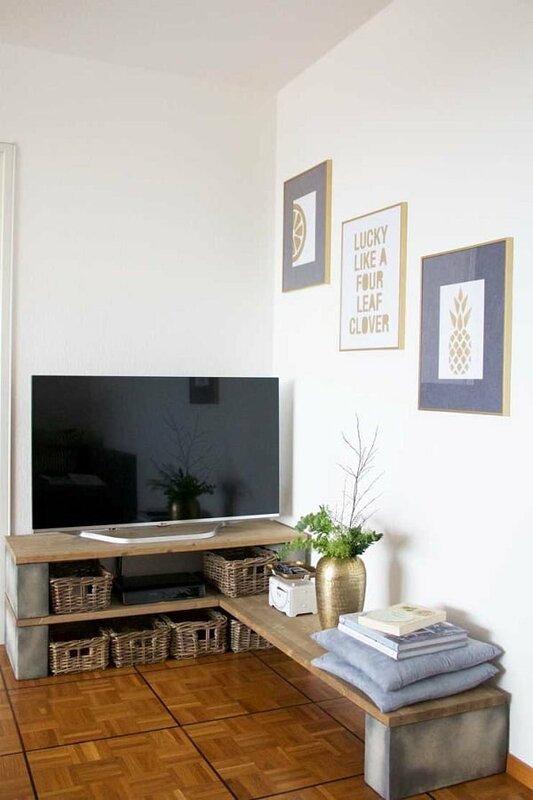 So why not build this simple but gorgeous farmhouse TV stand at home? With just a bit of effort, you can replicate this exact piece and introduce a bit of vintage energy to almost any room in the house. To create this piece you don’t have to be an expert carpenter, but you will need pine whitewood planks, a common board, as well as screws to be able to bring it all together strongly. This TV stand takes an atypical shape and has three shelf layers, which can transform the stand into a multi-purposeful piece, therefore don’t hesitate to experiment. Another project for wooden crates. It’s easy simple and quick, you can have a piece of furniture done in just a few minutes. 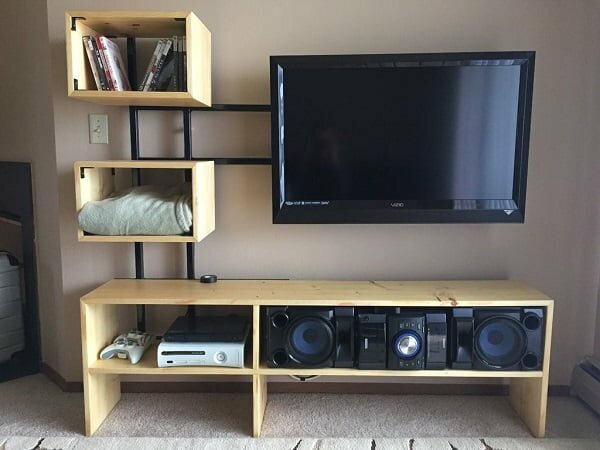 You can never go wrong with creating a custom-made crate TV stand, which works as a bookcase and storage shelves set at the same time. To achieve this design you will have to play around with crates of the preferred size, and some screws to secure the stand in place. As simplistic as this design may be, it is actually a favorable and pocket-friendly idea which can help you reflect a rustic appeal, too. 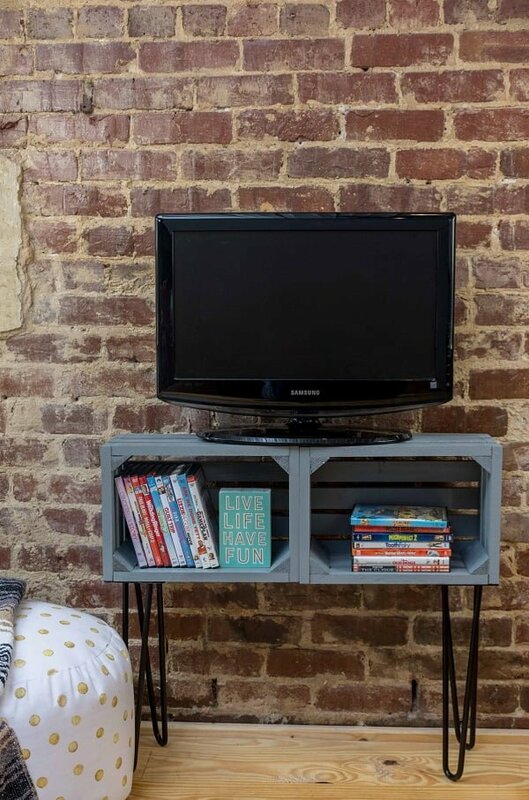 If you are keen on simple, yet adorable household projects, this crate TV stand is exactly what you’ve been looking for. 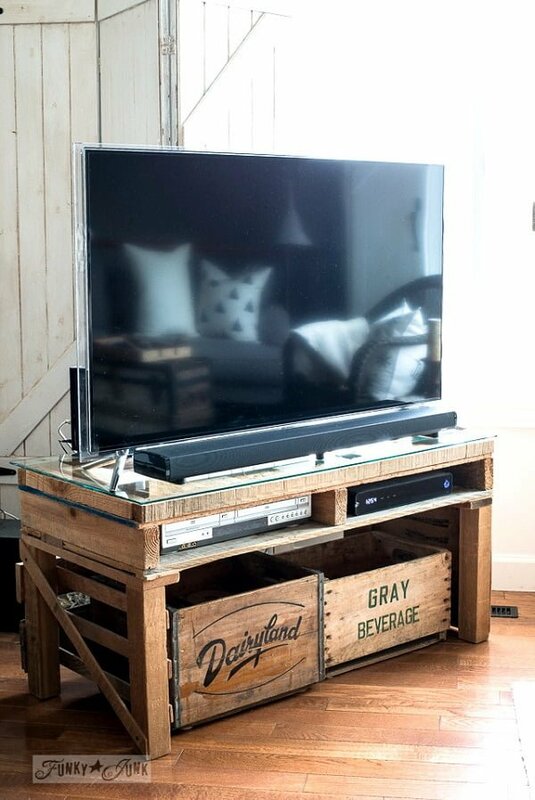 If you like the way pallets add a rustic warmth to your decor you have to have this media console at home. It’s a simple project but the impact is high. This handmade console is a fabulous example of how to use retro materials over and over again. To compose the console you will need palettes (as much as your space allows), brackets, and caster wheels. You can always go for a more complex design, as seen in this multi-spaced console. To achieve more practicality and utility, the console comes with caster wheels as well, which can basically take this console anywhere you, please. An easy and effective project for every craftsman. When you have very limited space and you want to use it effectively you need to get creative. 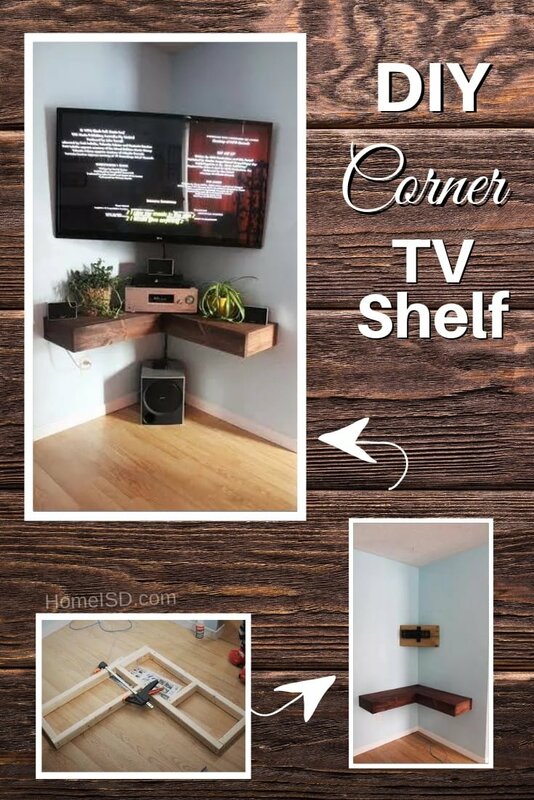 This project for a corner TV shelf is one of those cases. Use an empty corner of a room to place a TV and add a lot of decor value at the same time. It doesn’t take much to make a house corner stand out, and this amazing TV shelf is here to prove it. The minimalist design is focused on a floating shelf design, large enough to support an entire TV. To create it, use a hardwood plank frame and cover with pine tree top, giving the shelf/stand a rectangular appearance. Aside from this, you will need to install a wall mount TV hanger to offer more support. The project itself is not time-consuming and will introduce a definite oomph to your plain white walls. Worth the shot! Another way to introduce farmhouse style into your home and what a way it is. This sideboard table can be used for so much more than a TV stand with lots of storage space. It will definitely be a gem of an accent in your decor. This incredible concept is composed of different-size lumber pieces, tongue, and grove boards as well as bare necessities such as screws, nails, and glue. To make it more elegant and captivating, use a stain or a preferred paint and give the stand a pop. 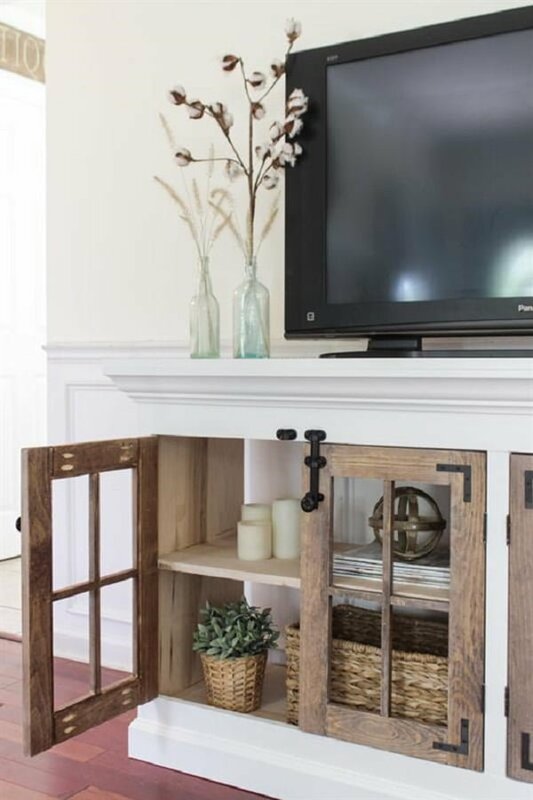 The mellow countertop and side barn door pattern give this sideboard TV stand the charm it needs, so make sure to keep these in your replica. Although a two-shelf stand, you can feel free to alter the dimensions in accordance with the room you have left. This walk-through shows you how to make a TV stand out of an old door. If you’re a fan of the re-use stores or you have some old doors laying around, they are perfect fodder for this project. The bonus with this idea is that you may already have an old door or if you have to buy one, it’s probably going to be cheap. 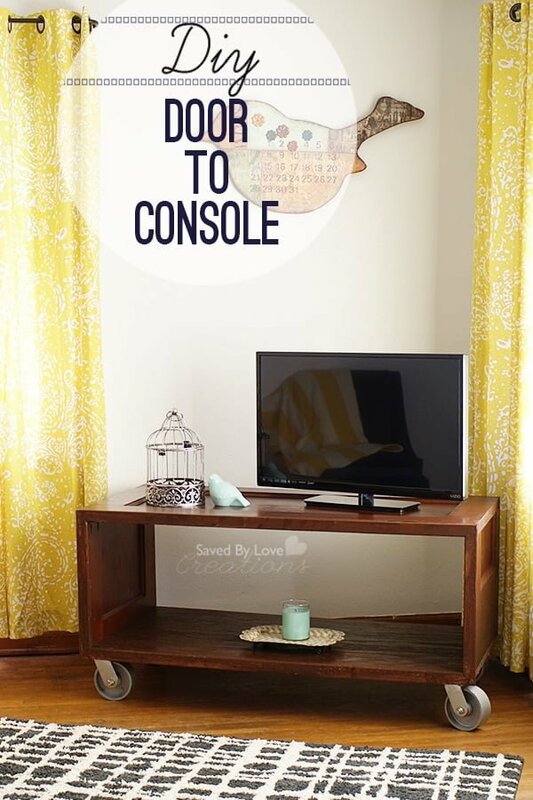 Give your old furniture a purpose and create an entire and functional TV console from an entrance door. Create this piece by using a whole hardwood door, cut and fit in accordance to the space you have available in your house. The single open- shelf space gives this TV console elegance and tastefulness, while the four caster wheels enable mobility and multi-functionality at the same time. A few connecting tool operations later, and you’ll have yourself an outstanding piece. Paint your TV console to match your setting and relocate it everywhere around the house. 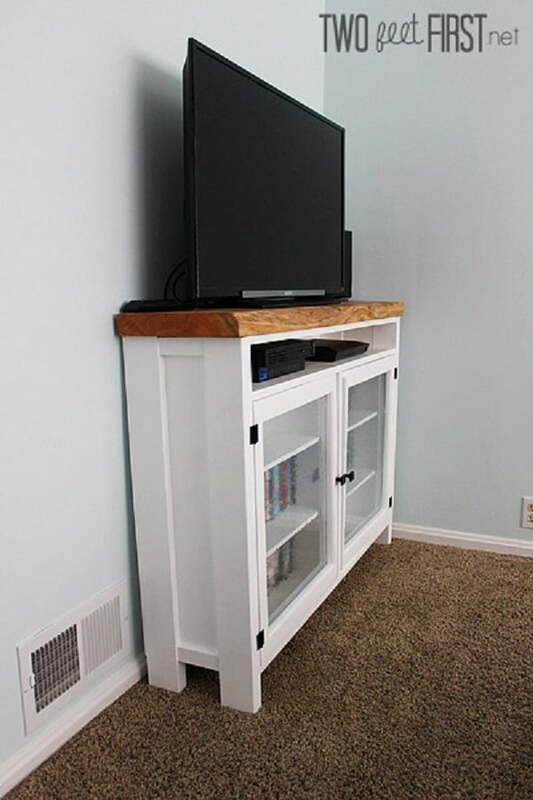 This slide show of images shows you how to construct your own TV stand out of real wood. You buy the materials including wood, hardware, glue, etc and then piece the whole thing together yourself. This one is not for the faint of heart and you should be handy with your hands. Use straight lumber and create a box-like design, fortified with metal screws. Feel free to use white pine for the stand’s countertop and sides. Finally, install a vertical, metal TV holder, and stain your TV stand using a brush. For extra sophistication, make sure to paint all screws and metal elements matte black, thus adding to the impact of the stand itself. Keep in mind that this is not among the simplest projects you’ve done, so make sure you know your craft enough to create this delightful TV stand. Furniture left for dead is sometimes your best bet for getting something nice for cheap. This blog post (with images) shows you an overview of what you need to do in order to fix up a side-of-the-road find. You’ll have to fill in the blanks of this tutorial with your imagination so if you need all the details, you may want to find another tutorial. This is another tutorial that helps you build your own TV stand from scratch using store-bought wood and hardware. If you’re willing to put in some elbow grease and you like a sense of accomplishment, this walk-through is great for you. To make it yourself, you will need a few simple materials and tools, including fence boards in several different dimensions, square stakes, flat brackets, and of course, screws. As the piece is a single level TV stand, you can create it in a matter of days! Adding a bit of twist is always recommended, so feel free to experiment with paint shades. Divided into three box shelves, the TV stand extends into a bench-like form to give the TV extra support. 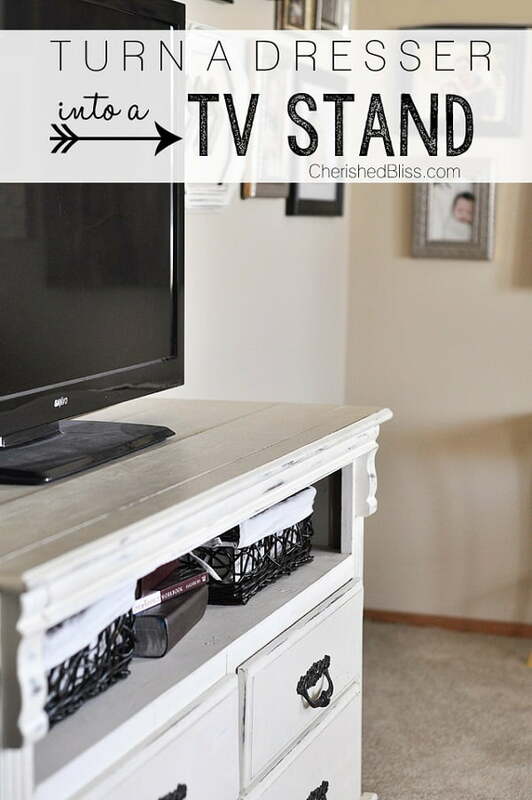 Need a post showing you how to make a simple and interesting TV stand? This one is for you. 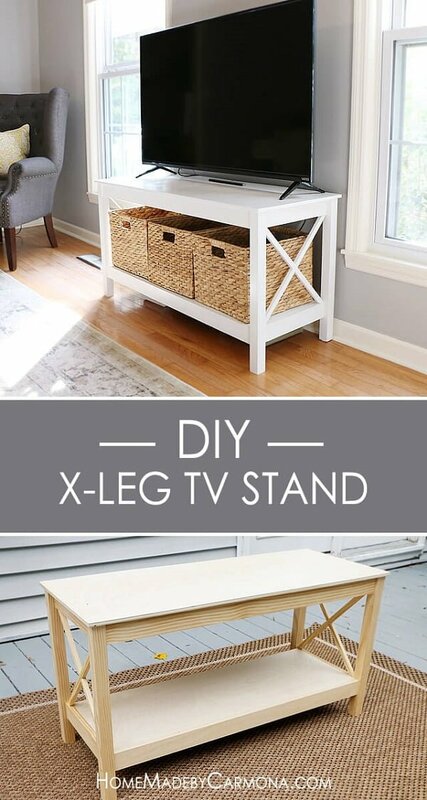 In no time flat, even the clumsiest carpenter can follow these steps to make a TV stand. You can also do it in one Saturday morning once you have all the materials. Creating this piece seems like an easy task, and it is, but it is always good to know your tools and skills. You will only need pine wood in different dimensions, wood stain, metal mending plates, and several concrete blocks. Use metallic spray paint to capture the inspiring color of the TV table. Also, make sure to add the under table decorative bench which is a great addition to this piece! If you’re into that millennial, urban look of wrought iron and rustic, this guide shows you how to accomplish that vision. This one is relatively simple but you’ll need to be handy with a hammer and drill. 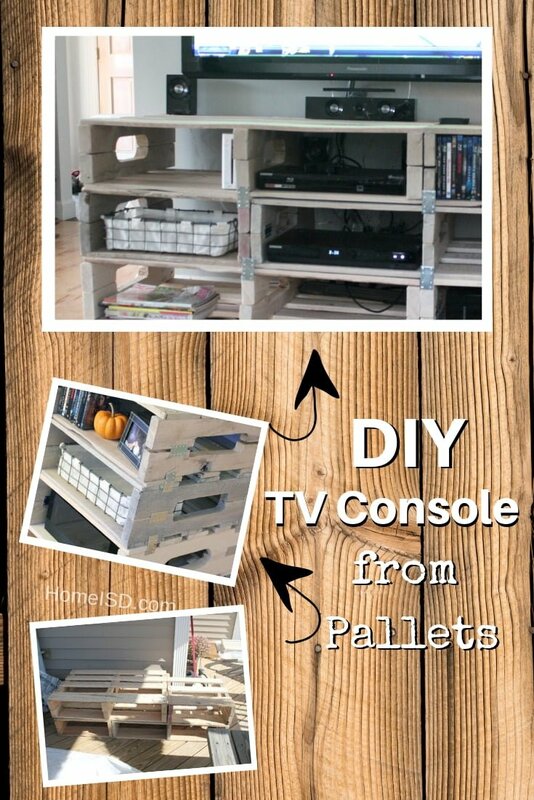 Up-cycling is all the rage and this set of instructions will show you how to up-cycle an old pallet into a trendy TV stand. You’ll need to have some tools for this one and know how to use them but it’s more demo than creative building. 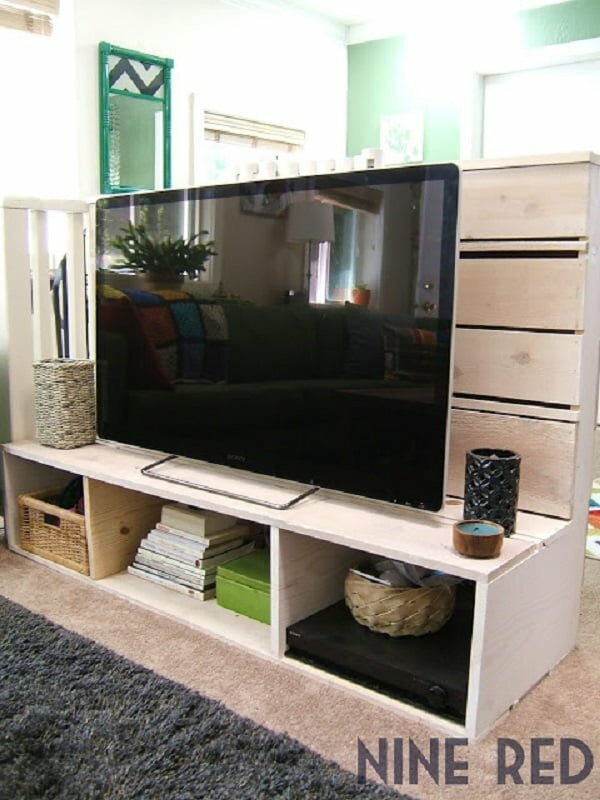 If you happen to have one or more palettes just lying around in your garage, it is time to make this dreamy TV stand alive! Using simplistic materials and tools is always inspiring and beyond chic, and this TV stand exudes simplicity and a pure design outburst. You will need to divide the palette into two segments, and then use hairpin legs to install the table. Use metal holders and screws to keep the table in place and, voila, you did it. While it may take some time to find the perfect pieces, this futuristic TV stand is worth it. This tutorial shows you how to get a country home look without dropping several hundred dollars. If you like the finished look in the pictures you can download the build plans from the post. Can you imagine doing something as clean and as refined as this TV stand? Well, this effortless design is actually easy to achieve and all you need is a bit of willpower…and some other things. For instance, use light hardwood, and pay attention to the adorable X-legs. You can transform an old table and bring it back to the old days, so do it. While white is bright and space-opening, consider painting your TV stand in any color which matches your environment. Last but not least, fill the open shelf with practical bamboo containers to enable both privacy and storage space. The farmhouse look is growing in popularity and you can achieve the look on your own. You’ll need to buy the materials but this tutorial is as good as actual blueprints. You should have no issue getting it right as long as you can follow directions. This extravagant and rustic-looking console cabinet serves as both practical and decorative segment which uses hardwood in different dimensions, glass, precious cabinet door knobs connected to the black iron frame pieces. Well, you don’t need plenty of luxury to do this, but what you will need is a good set of skills to help you complete this complex piece. However, ain’t no mountain high enough, and if executed right, your TV corner will shine. This one is even more Pottery Barn than the other tutorial complete with alphabetized drawers and that distressed wood look. Pros only need apply for this tutorial so if this is your first wood working project, you might want to sit it out. Bringing old-fashioned sophistication back is now possible, and all it takes is one statement media console. This rare piece of furniture has apothecary drawers and has a rustic wood pattern which speaks of quality. By combining poplar wood, as well as plywood shelves, you can master in the field of interior design. As with every other masterpiece, this media console requires technicality, and exceptional skill set and a great eye for mishaps. Still, this is a challenge worth taking on, as the screwing and gluing technique is fairly standardized. What you are ultimately trying to achieve is a nostalgic element, worthy of respect. 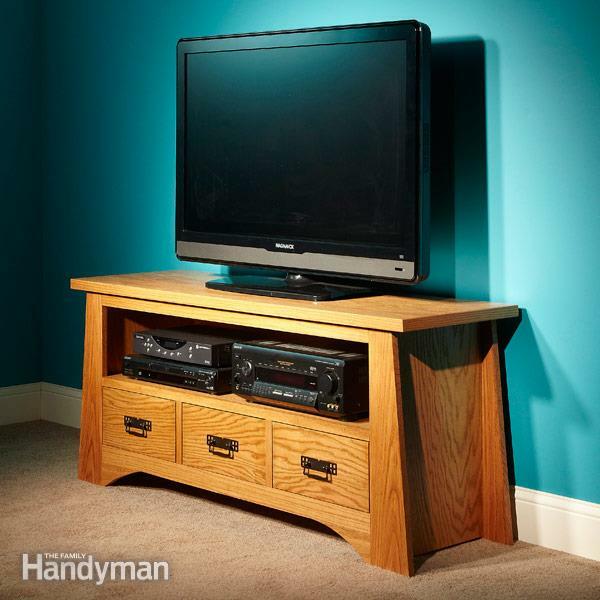 Need a simple set of plans to follow just to get your TV stand off the ground? This post is for you. 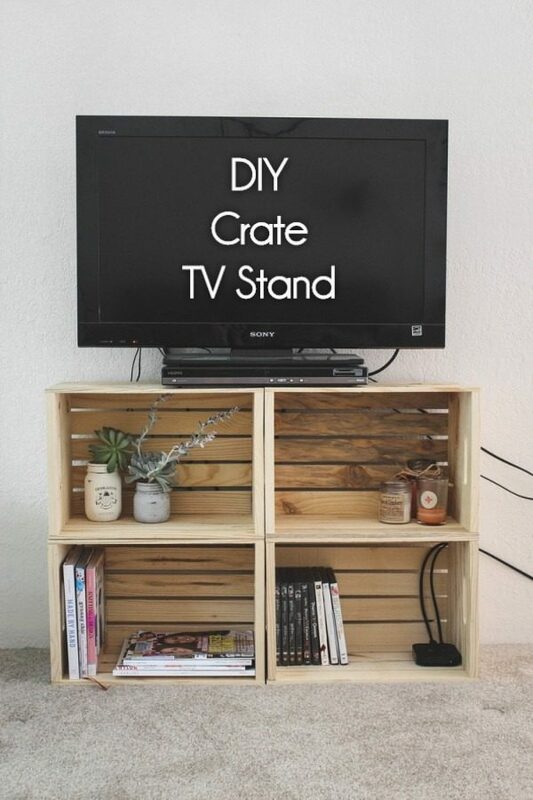 A couple of crates and a little effort and you’ll have a TV stand in no time. Simple TV stand designs can speak volumes of quality and innovation. 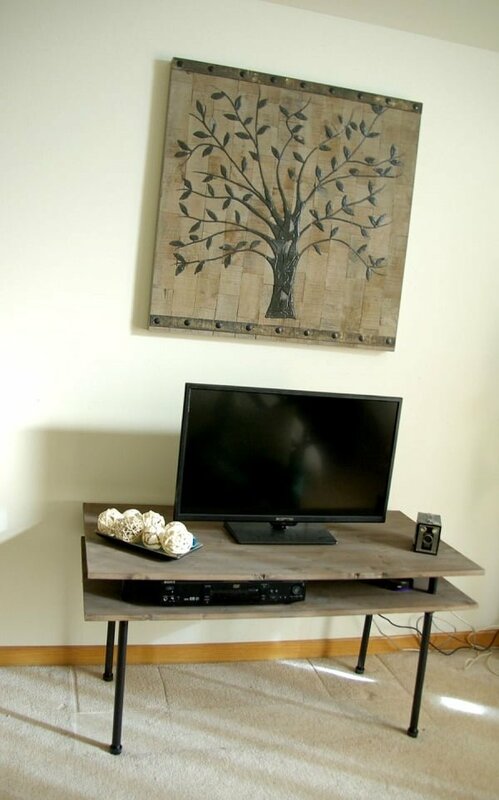 Look at this marvelous TV stand and get ready to get busy and do it yourself! To recreate this piece, you will need crates, a mellow blue paint, some screws to keep it all together and unique pin legs to add a bit of futurism into the stand itself. 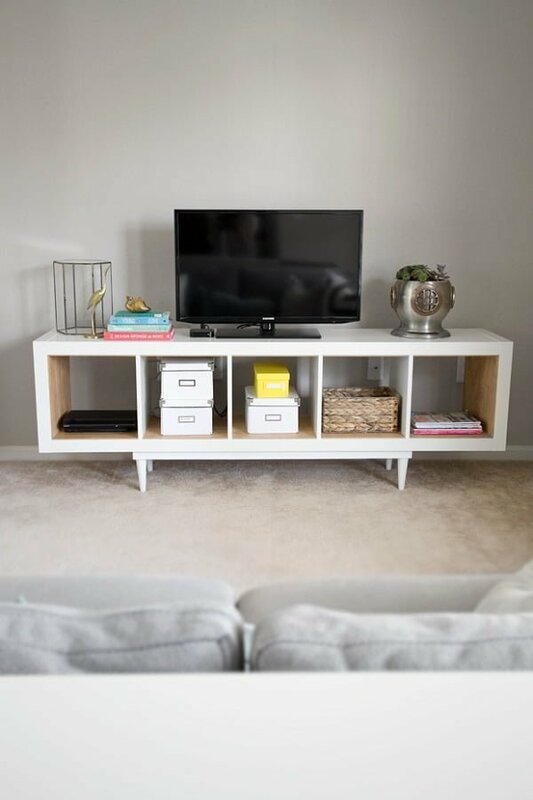 A few gluing sessions and a few holders placements later, you will find yourself with an uber-appealing and dynamic TV stand which doesn’t take up too much space and still offers open shelves for decorative bits. Best of all, anyone can do it! 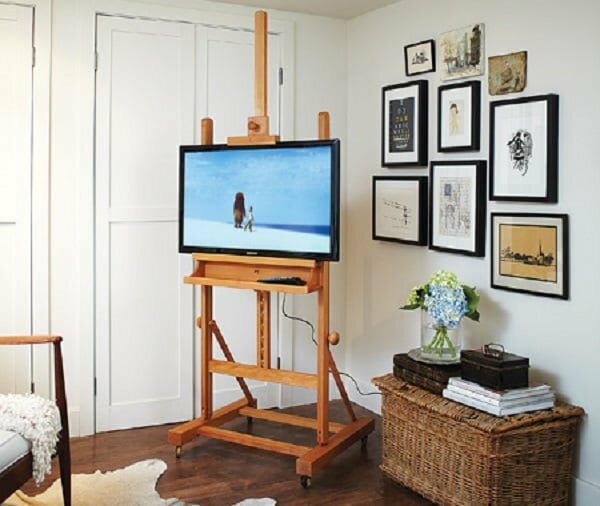 If you’re feeling artsy this DIY easel TV stand tutorial is super trendy. This is another one for a handy wood worker or persistent beginner. This is a super easy tutorial that turns an IKEA stand into a retro piece of art. All you need is some extra pieces and some glue and you’re good to go. You’ll obviously need an IKEA TV stand too. This artistic TV stand may look all fancy and elegant, but it is actually an easy task ahead for every craftsman with a particular taste in furnishing. To master this piece, you will need basic carpenter elements, such as a basic IKEA table, gold spray paint, brass starburst plates, and a few brass knobs to give the stand a little kick and zest. While a particular drilling technique will be required, it doesn’t take up plenty of professionalism to complete this project. This one is for the weekend warrior and skilled wood worker. The main benefit is that you come out at the other end with a solid TV stand you can pass down to your kids. If you got extra time on your hands, why not create this fabulous TV stand which speaks of class and playfulness? 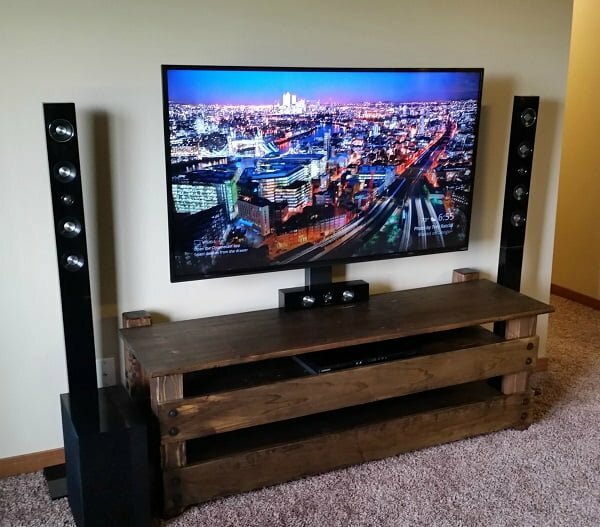 As a cheap project for any ambitious carpenter, this TV stand will only require a few basic elements, such as oak plywood, pocket screw jigs, and drawer slides! A proper framing and securing in place will lead you to the final outlook of this TV stand, which is both nostalgic and refined at the same time. A bit of experience may be needed in terms of creating the box drawers and measuring them to fit perfectly into the main stand structure. Re-purposing old furniture is one of the cheapest and easiest ways to get a unique look. This project is for pretty much anyone that can get a hold of an old mid-height dresser and has a Saturday afternoon to burn. Why not think in terms of recreating an old dresser into a fascinating and practical TV stand? Begin by painting the dresser itself and assembling the internal dresser doors to serve as shelves. Working on these drawers can spark up your creativity and actually allow you to play with a distressed design that is more than appealing. Keep the vintage doorknobs as well, to still capture the retro aspect of the TV stand. With no sanding involved, this project is both cheap and easy to do. Get crafting! 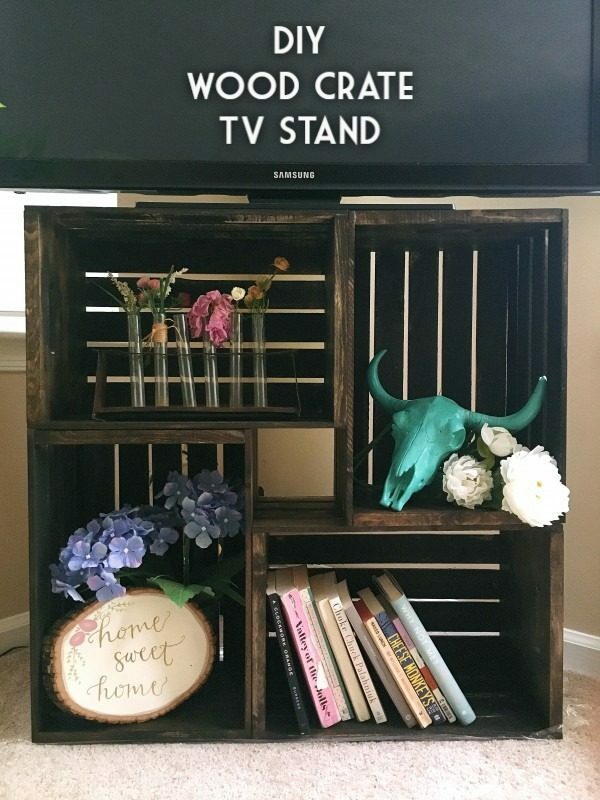 This is the second post showing you a new way to make a TV stand out of an old pallet. This project is a little more advanced than the other pallet transformation but totally worth it in the end. If you want a simple stand that does the trick this project is for you. It’s basically two boards, four metal legs, and a Sunday afternoon. Find joy in crafting furniture once more with this functional and endearing TV stand. If you have a few extra hours to spend on this project, let’s get moving and create this statement TV stand. Simple in concept, this piece won’t take up too much of your time or pocket. Speaking of simple materials, you will need two large rectangular boards, thick enough to hold the TV in place. A bit of sanding may be involved, to smooth out the TV stand’s texture, but nothing too complicated for your average handyman. Finally, install thick pipes and start staining, making sure both boards’ sides are equally covered. Voila! For this process you will need some old windows, wood, and a weekend. This stand is a labor of love so if you need something quick you may want to check out other tutorials. Showcase TV stands never looked so good! Creating this unique TV stand is a quite the handful project, so if you have the time and patience to execute it right, the results will not disappoint. Creating this TV stand will require using standard elements, like different-size pine boards, window glass, plywood, and of course, a screwing and painting kit. A bit of cutting here and there can truly add quality to your TV stand while keeping the shades neutral will open the space drastically. To preserve the retro feel of this stand, make sure you keep the cute cabinet knobs as part of the design. Just because your IKEA unit is marketed as a shelf doesn’t mean it has to be that way. This tutorial is for anyone that has an applicable IKEA shelf that can be converted into a TV stand (you’d be surprised at what qualifies). Aside from the IKEA unit itself, you will need to purchase birch plywood, wax, clamps, as well as a paint of your choosing. Of course, sanding is a standard step in creating this TV stand, so make sure you know your craft just enough to succeed. Ultimately, you are hoping to achieve a four-box-shelf TV stand that requires minimal effort at a minimal cost. This project takes some serious effort and time but the finished product will have your friends talking. This isn’t the most complicated stand but it will definitely take you some time and some skill to accomplish. If you are looking to impress design nerds, this is the project to do. This incredible, yet complex floating TV stand is composed of various segments, all wrapped up in a synchronized and practical unity. While a demanding task, this TV stand can truly captivate a playful and intelligent design at its best if executed right. To create it, use pine boards, square tubes, corner pieces, spray paint, and rags. As the piece is multi-layered, make sure the backbone of the TV stand is firmly and properly installed. Once that is handled, you can move on to painting and decorating. Have fun!